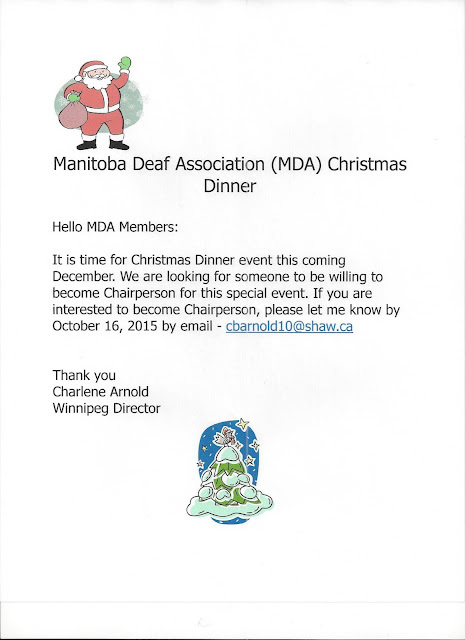 Deaf Centre Manitoba Inc.: Anyone interested to host Manitoba Deaf Association (MDA) Christmas Dinner Party 2015?? Anyone interested to host Manitoba Deaf Association (MDA) Christmas Dinner Party 2015?? Deaf Fellowship Family Winter Retreat 2016!! ASL Night for Thursday, October 15th!! Friendly reminder to sign up for Deaf Yoga! Severe \Thunderstorm warning for Winnipeg!